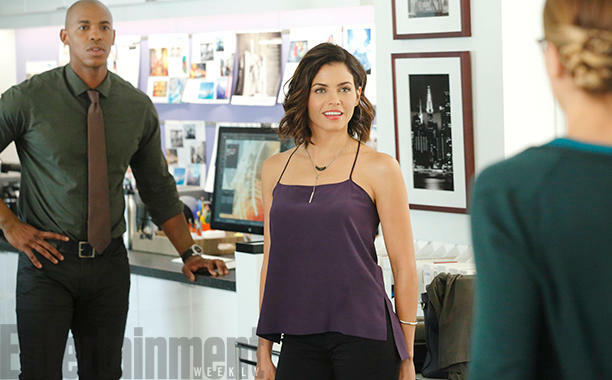 Entertainment Weekly has unveiled an exclusive photo of Jenna Dewan-Tatum as Lucy Lane in CBS’s Supergirl. When I initially took a look at the photo, I couldn’t help and notice the striking resemblance that Dewan-Tatum has with Erica Durance, who played Lois Lane in Smallville. It makes me wish that Durance would appear on the show as Lois but alas it won’t happen as the two shows don’t take place in the same universe unless one of the The Flash’s multiverses includes Smallville. Dewan-Tatum will appear in several episodes of the freshman series as a former flame of James Olsen (Mehcad Brooks), whom she knows as Jimmy. According to the Entertainment Weekly article that is visiting National City right a wrong. In addition, the article contains a quote from executive producer Ali Adler with more details on Lucy’s role in the series. Sounds like this version of Lucy won’t be as annoying as Smallville’s version where she was played by Peyton List and was more of a wild child character that Lois had to control/babysit. Although I did think that List was a good choice to play Lucy too. Supergirl premieres October 26, 2015 at 8:30pm ET/PT on CBS and Global.